In the past two blogs we examined buttons, but by no means began to cover every type nor style nor material from which they are manufactured. 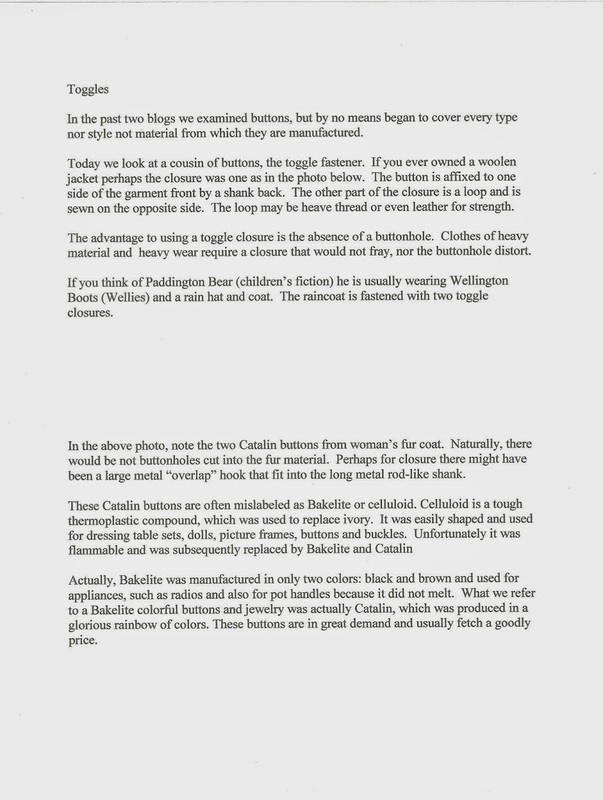 Today we look at a cousin of buttons, the toggle fastener. If you ever owned a woolen jacket perhaps the closure was one as in the photo below. The button is affixed to one side of the front of the garment by a shank back. The other part of the closure is a loop and is sewn on the opposite side. The loop may be heavy thread or even leather if extra strength is required. The advantage of using a toggle closure is the absence of a buttonhole. Clothes of heavy material and heavy wear require a closure that would not fray nor distort the butoinhole. If you think of Paddington Bear ( Children’s literature) he is usually wearing Wellington Boots (Wellies) and a rain hat and coat. The raincoat is fastened with two toggle closures. Although toggles can be made of many materials, today they are usually made of wood, in a barrel-shape. Note the metal shank on the back for affixing them to the garment. In the above photo, note the two Catalin buttons from a woman’s fur coat (top left). Naturally, there would be no buttonholes cut into the fur material. Perhaps for closure, instead of thread loops there might have been a large metal “overlap” hook that fit into the long metal rod-like shank. These Catalin buttons are often mislabeled as Bakelite or celluloid. Celluloid is a tough thermoplastic compound, which was used to replace ivory. It was easily shaped and used for dressing table sets, dolls, picture frames, buttons and buckles. Unfortunately it was flammable and was, subsequently, replaced by Bakelite and Catalin. Actually, Bakelite was manufactured in only two colors: black and brown. It was used for appliances such as radios and pot handles because it did not melt. When we refer to Bakelite colorful buttons and jewelry they were actually made of Catalin, which was produced in a glorious rainbow of colors. These buttons are in great demand and usually fetch a goodly price.